01.20.11 Forget balance. Being a working mom requires integration. When I snapped the picture at left, I was just about to return to work as a senior editor at Fit Pregnancy after a three-month maternity leave. Truth be told, I couldn’t wait to get back to work. More specifically, get back to a schedule. Caring for a newborn all day, every day is one of the most physically challenging things I have ever done. Add to that the willy-nilly nature of a brand new baby’s “schedule” and, well, I found new motherhood exhausting and overwhelming. Working full-time was way easier than being a full-time mom. While I was thrilled to be back at work, I wasn’t prepared for just how tired I would be (nursing two to three times a night really takes a toll on your sleep) and how caring for a child isn’t just something you do when you’re with them. It’s something you do all the time. 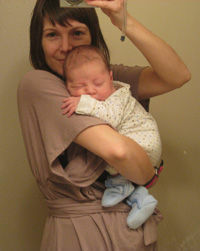 So, in addition to having a job that demanded my full attention, I had a new baby who was constantly on my mind, too. My son is now 2-years-old, and I’m still trying to figure out the best way to work and be a parent, too. For my son’s first year, that meant pumping three times a day at work in between emails and meetings. (See our Pumping At Work page for tips and techniques on how to make it work for you on the job) More recently, it means finding a free Monday morning in my work schedule so I can volunteer in my son’s preschool classroom. The dictionary defines integration as “to form, coordinate, or blend into a functioning or unified whole.” Isn’t that what most working moms are striving for? To be, at the very least, a functional employee and mom? And, at most, to feel that we are at our best when our whole self includes working and parenthood? I, for one, am going to take Christy's word choice to heart and think of my role as a working mom as just one part of a bigger and better me-rather than a balancing act I'll never get quite right. What about you? How many roles are you trying to integrate as a working mom?